While heating and air conditioning might feel like a luxury for homeowners, it’s an absolute necessity in the workplace. The productivity of your employees is shown to decrease when temperatures are not ideal for comfort. Likewise, humidity levels can exacerbate these feelings. Humidity levels between 30% and 50% are where most people find comfort, with 45% being the ideal. If humidity falls outside of this range, the air is either too dry or too moist, and it can make the temperature feel worse than it really is. Luckily, dehumidifiers can be installed in the central HVAC system to balance humidity levels in the whole building. For climates with high humidity, it might not be enough just to have an air conditioner. In any situation, ventilation is key. But if the production of pollutants is too much, it will take more than just ventilation to fix the problem. With UV lights and air cleaners, these pollutants can actively be destroyed. UV lights are best for living microorganisms, such as bacteria, germs, and viruses. They’ll prevent these contaminants from living in your air circulation and infecting employees and customers alike. Air cleaners, on the other hand, are best for particles, chemicals, odors, and contaminants that create long-term health risks. They’re essential for industrial settings. While not strictly an air quality issue, we want to mention duct leaks since they can contribute to worsened air quality. But aside from that, they can contribute to money lost. After a central HVAC system has had some years to settle in, it’s not uncommon for the ductwork to fall into disrepair. 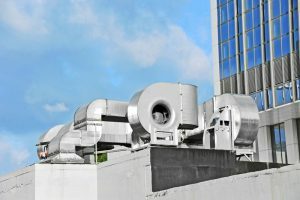 The sealants keeping the steel ducts together may begin to loosen and lose their adhesive qualities, which can lead to leaks or complete disconnects. It’s estimated that nearly 30% of your conditioned or heated air can be lost through duct leaks! If it’s been several years since you’ve had your ductwork inspected, leaks or disconnects might be contributing to increases in your monthly utility bills. A thorough inspection from a commercial HVAC service in Mandeville, LA will be able to confirm this for you. To learn more about how improving indoor air quality can help your business, contact Professional Heating & Air today!